Here at Team LC, we love a fellow creative mind when we meet one. Whether that’s another blogger, a musician, a chef or an artist, we find that there’s a mutual understanding between people who have jobs that require us to wake up and create something every day. So, it shouldn’t come as a surprise that when we first met Mr. Gray Malin at his photography series party at his LA home, we were besties at first sight. 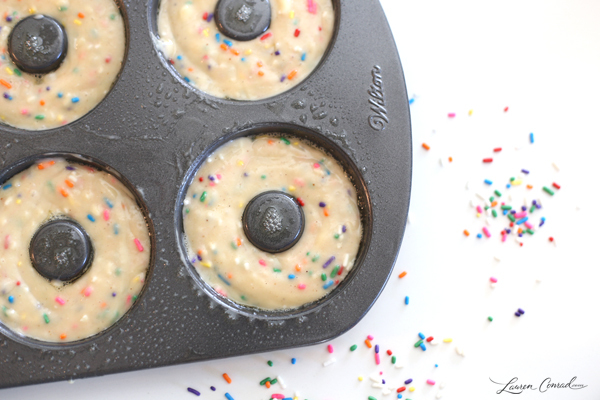 So many of Gray’s gorgeous aerial beach photographs make his subjects look like pretty little beach sprinkles… so when Gray had the idea to bake beach sprinkle donuts, we knew we had to be a part of it (we could already picture the Pinterest-worthy pictures). 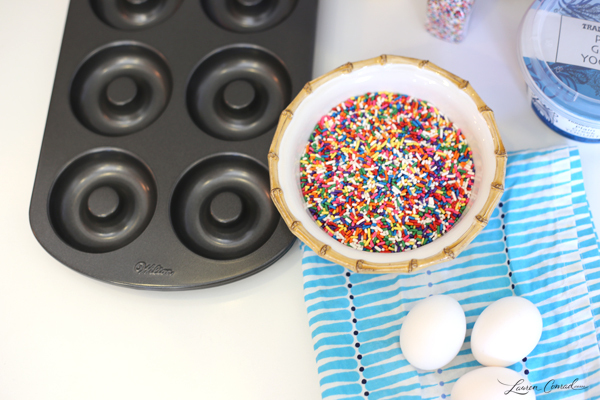 Today we are sharing some fun snaps from our beach sprinkle donut baking day, along with the recipe so you can make a batch yourself. 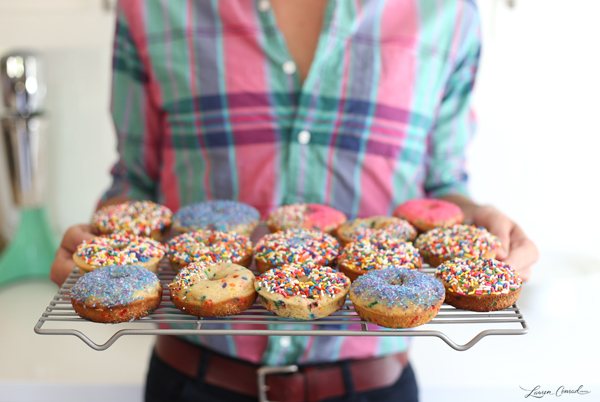 This recipe, inspired by Sally’s Baking Addiction’s baked funfetti donuts, was actually surprisingly easy. And you can rest assured that they taste just as good as they look. 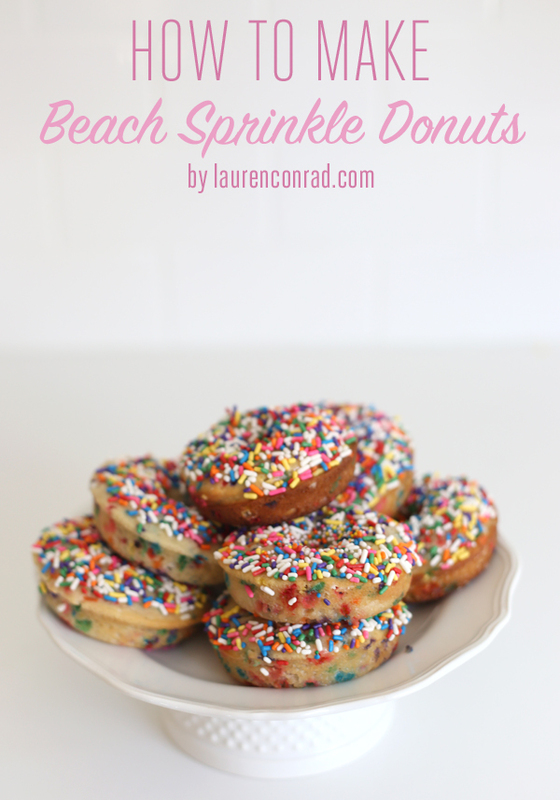 Without further do, we give you beach sprinkle donuts…. First, preheat your oven to 350 degrees and spray your donut baking sheet with a non-stick spray. 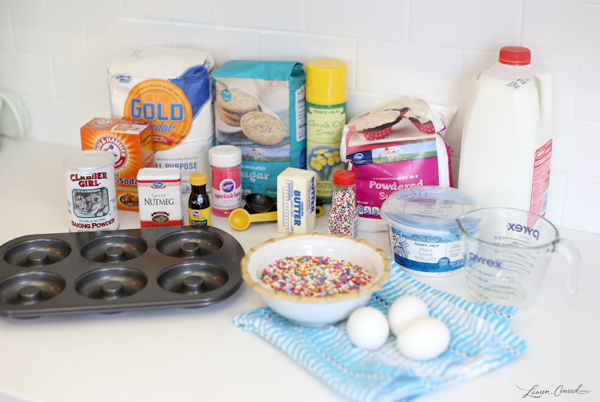 In a medium bowl, mix together the flower, baking powder, baking soda, nutmeg and powdered sugar, then set aside. In another bowl, whisk together the milk, yogurt and egg until smooth. Add in the vanilla and melted butter while whisking until combined. 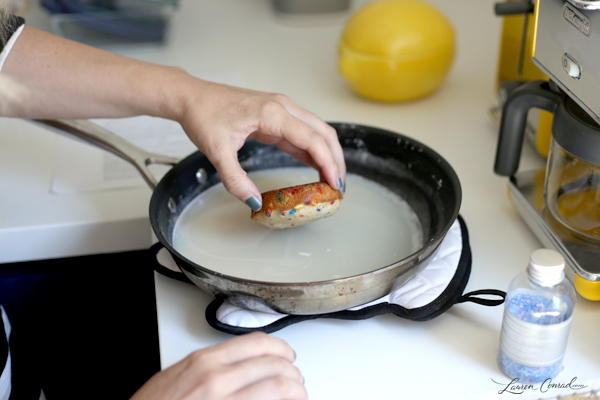 Fill a large Ziplock bag with the donut batter, then one of the bottom corners off, making a small hole. 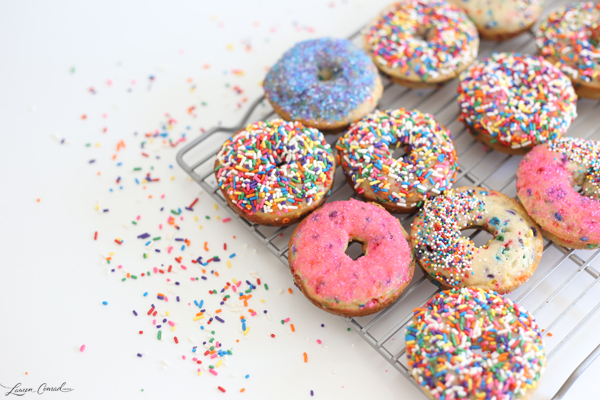 Fill each donut cup with batter by slowly squeezing on the bag, allowing the batter to come out of the hole. Fill each donut cup 2/3 of the way full, keeping in mind that they rise when baked. Bake for 10-12 minutes, or until the edges are lightly browned. 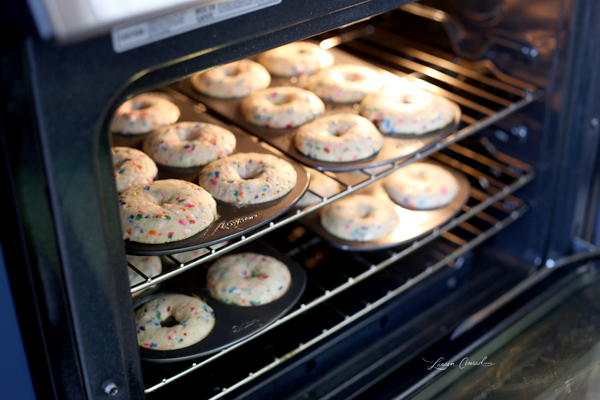 Remove from the oven and let your donuts fully cool before dipping them in the glaze. Combine the glaze ingredients in a medium saucepan over low heat. Whisk together until the glaze is fully mixed and smooth. Remove the pan from heat and let the glaze cool a bit (it will be hot!). When it’s warm, but not cool, dip the top of each donut into the glaze. 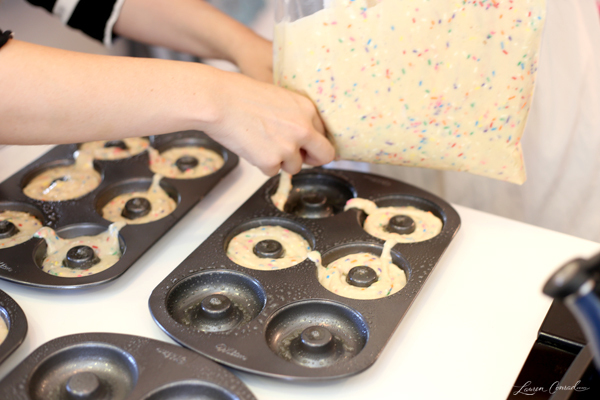 Transfer each donut to a baking rack and let dry. We dunked our donuts twice for that white glaze appearance. 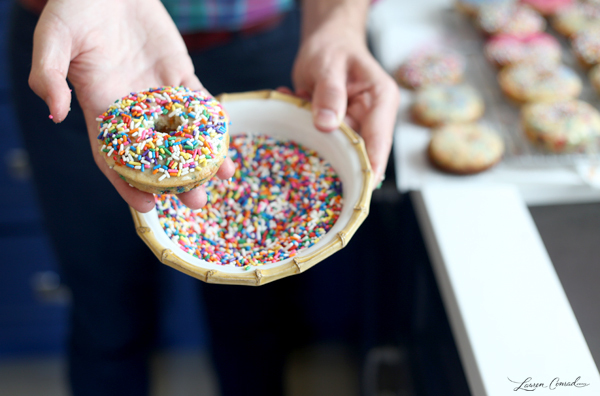 After the second dunk, place the whole glazed side of the donut into a bowl filled with sprinkles. 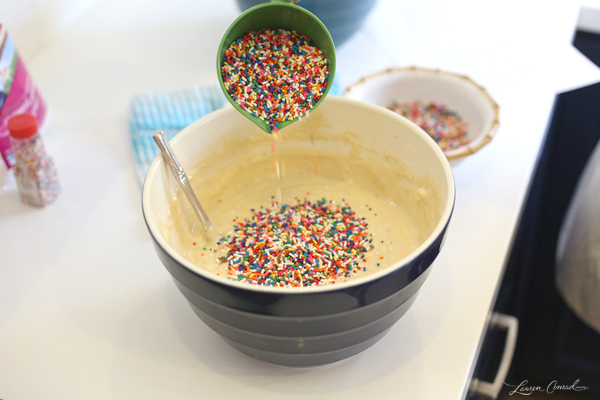 (You can also scatter sprinkles on top, but we liked the look of tons of sprinkles!). 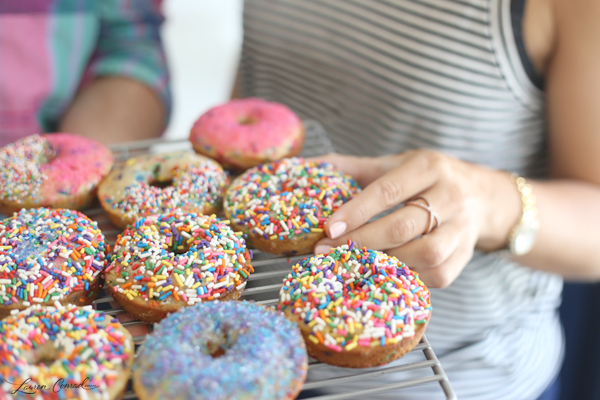 If you give these beach sprinkle donuts a try, be sure to Instagram a photo afterward with the hashtag #LCxGMdonuts. We might even go through and give your photo a “like”! 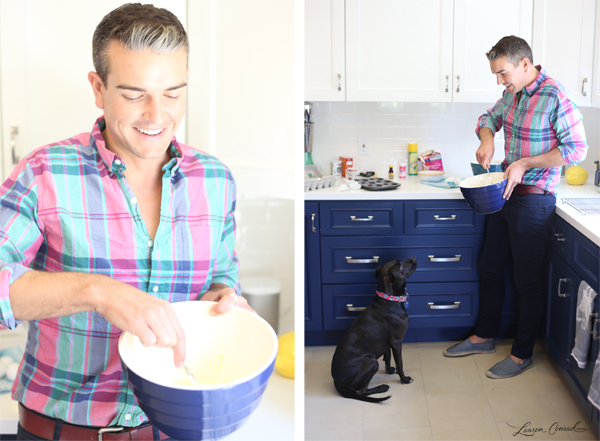 What delicious treat would you like to see us cook up next? P.S. Thanks again to Sally’s Baking Addiction for the recipe inspo and tips!